The goal of WP5 is the development of a synthetic change or novelty index (BACIndex) that allows for detecting sudden events and abnormal changes in the multivariate EO data streams. The index will be generic, but in the context of the project, specific emphasis will be on detecting abrupt changes that are relevant to the essential ecosystem variables, i.e. properties relevant to the functioning of terrestrial ecosystems, biosphere-atmosphere exchanges of matter and energy, and biodiversity related properties. The problem of detecting change in given data is a challenging machine learning problem and is often referred to as “novelty detection” or “discovery”. 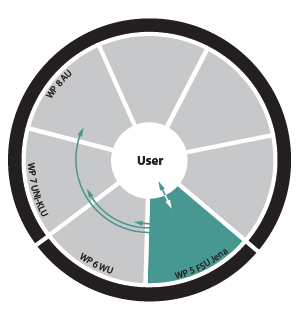 WP5 also entails an attribution scheme, i.e. machine learning techniques that allow for measuring the influence of input variables on the novelty detection score. Hotspots of Anomalies: combining different machine learning methods we try to detect extreme events in historical data and define those areas with higher amount of abnormal records. Here is shown the average of anomalies over the year 2010, with the 2010 Russian heat wave. 1 Barz, B., Rodner, E., Garcia, Y. G., Denzler, J. (2019). Detecting regions of maximal divergence for spatio-temporal anomaly detection. IEEE Transactions on Pattern Analysis and Machine Intelligence, 41(5), 1088-1101. doi:10.1109/TPAMI.2018.2823766. 2 Chernetskiy, M., Gobron, N., Gómez-Dans, J., Morgan, O., Lewis, M. D. P., Schmullius, C. (2018). Simulating arbitrary hyperspectral bandsets from multispectral observations via a generic Earth Observation-Land Data Assimilation System (EO-LDAS). Advances in Space Research, 62(7), 1654-1674. doi:10.1016/j.asr.2018.07.015. 3 Cremer, F., Urbazaev, M., Berger, C., Mahecha, M. D., Schmullius, C., Thiel, C. (2018). An image transform based on temporal decomposition. IEEE Geoscience and Remote Sensing Letters, 15(4), 537-541. doi:10.1109/LGRS.2018.2791658. 5 Flach, M., Sippel, S., Gans, F., Bastos, A., Brenning, A., Reichstein, M., Mahecha, M. D. (2018). Contrasting biosphere responses to hydrometeorological extremes: revisiting the 2010 western Russian Heatwave. Biogeosciences, 16, 6067-6085. doi:10.5194/bg-2018-130. 6 García, Y. G., Shadaydeh, M., Mahecha, M. D., Reichstein, M., Denzler, J. (2018). BACI: Towards a biosphere atmosphere change index - Detection of extreme events in the biosphere. In BigSkyEarth conference: AstroGeoInformatics (pp. 1-6). 7 Guanche Garcia, Y., Rodner, E., Flach, M., Sippel, S., Mahecha, M. D., Denzler, J. (2016). Detecting multivariate biosphere extremes. In A. Banerjee, W. Ding, V. Dy (Eds. ), Proceedings of the 6th International Workshop on Climate Informatics: CI2016: NCAR Technical Note NCAR/TN-529+PROC (pp. 9-12). Boulder: National Center for Atmospheric Research. 8 Kraemer, G., Reichstein, M., Mahecha, M. D. (2018). dimRed and coRanking—unifying dimensionality reduction in R. R Journal, 10(1), 342-358. doi:10.32614/RJ-2018-039. 9 Pappas, C., Mahecha, M. D., Frank, D. C., Babst, F., Koutsoyiannis, D. (2017). Ecosystem functioning is enveloped by hydrometeorological variability. Nature Ecology & Evolution, 1(9), 1263-1270. doi:10.1038/s41559-017-0277-5. 10 Rodner, E., Barz, B., Guanche, Y., Flach, M., Mahecha, M. D., Bodesheim, P., Reichstein, M., Denzler, J. (2016). Maximally divergent intervals for anomaly detection. In ICML 2016 Anomaly Detection Workshop. doi:10.17871/BACI_ICML2016_Rodner. 11 Shadaydeh, M., Garcia, Y. G., Mahecha, M. D., Reichstein, M., Denzler, J. (2018). Causality analysis of ecological time series: a time-frequency approach. In C. Chen, D. Cooley, J. Runge, E. Szekely (Eds. ), 8th International Workshop on Climate Informatics: CI 2018 (pp. 111-114). 12 Sippel, S., Forkel, M., Rammig, A., Thonicke, K., Flach, M., Heimann, M., Otto, F. E. L., Reichstein, M., Mahecha, M. D. (2017). Contrasting and interacting changes in simulated spring and summer carbon cycle extremes in European ecosystems. Environmental Research Letters, 12: 075006. doi:10.1088/1748-9326/aa7398. 13 Sippel, S., Otto, F. E. L., Flach, M., van OLdenborgh, G. J. (2016). The role of anthropogenic warming in 2015 central european heat waves. Bulletin of the American Meteorological Society, 97(12), S51-S56. doi:10.1175/BAMS-D-16-0150.1. 14 Sippel, S., Zscheischler, J., Heimann, M., Lange, H., Mahecha, M. D., van Oldenborgh, G. J., Otto, F. E. L., Reichstein, M. (2017). 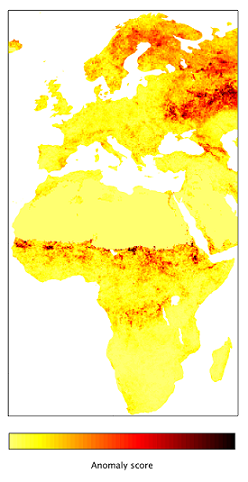 Have precipitation extremes and annual totals been increasing in the world’s dry regions over the last 60 years? Hydrology and Earth System Sciences, 21(1), 441-458. doi:10.5194/hess-21-441-2017. 15 Sippel, S., Zscheischler, J., Heimann, M., Otto, F. E., Peters, J., Mahecha, M. D. (2015). Quantifying changes in climate variability and extremes: Pitfalls and their overcoming. Geophysical Research Letters, 42(22), 9990-9998. doi:10.1002/2015GL066307. 16 Sippel, S., Zscheischler, J., Mahecha, M. D., Orth, R., Reichstein, M., Vogel, M., Seneviratne, S. I. (2017). Refining multi-model projections of temperature extremes by evaluation against land–atmosphere coupling diagnostics. Earth System Dynamics, 8(2), 387-403. doi:10.5194/esd-8-387-2017. 17 von Buttlar, J., Zscheischler, J., Rammig, A., Sippel, S., Reichstein, M., Knohl, A., Jung, M., Menzer, O., Arain, M. A., Buchmann, N., Cescatti, A., Gianelle, D., Kieley, G., Law, B. E., Magliulo, V., Margolis, H., McCaughey, H., Merbold, L., Migliavacca, M., Montagnani, L., Oechel, W., Pavelka, M., Peichl, M., Rambal, S., Raschi, A., Scott, R. L., Vaccari, F. P., van Gorsel, E., Varlagin, A., Wohlfahrt, G., Mahecha, M. D. (2018). Impacts of droughts and extreme-temperature events on gross primary production and ecosystem respiration: a systematic assessment across ecosystems and climate zones. Biogeosciences, 15(5), 1293-1318. doi:10.5194/bg-15-1293-2018. 18 Zscheischler, J., Mahecha, M. D., Avitabile, V., Calle, L., Carvalhais, N., Ciais, P., Gans, F., Gruber, N., Hartmann, J., Herold, M., Ichii, K., Jung, M., Landschützer, P., Laruelle, G. G., Lauerwald, R., Papale, D., Peylin, P., Poulter, B., Ray, D., Regnier, P., Rödenbeck, C., Roman-Cuesta, R. M., Schwalm, C., Tramontana, G., Tyukavina, A. T., Valentini, R., van der Werf, G., West, T. O., Wolf, J. E., Reichstein, M. (2017). Reviews and syntheses: An empirical spatiotemporal description of the global surface–atmosphere carbon fluxes: opportunities and data limitations. Biogeosciences, 14(15), 3685-3703. doi:10.5194/bg-14-3685-2017.